Online Only - Usually Ships in 1-5 days. A rollicking true-crime adventure and a captivating journey into an underground world of fanatical fly-tiers and plume peddlers, for readers of The Stranger in the Woods, The Lost City of Z, and The Orchid Thief. On a cool June evening in 2009, after performing a concert at London's Royal Academy of Music, twenty-year-old American flautist Edwin Rist boarded a train for a suburban outpost of the British Museum of Natural History. Home to one of the largest ornithological collections in the world, the Tring museum was full of rare bird specimens whose gorgeous feathers were worth staggering amounts of money to the men who shared Edwin's obsession: the Victorian art of salmon fly-tying. Once inside the museum, the champion fly-tier grabbed hundreds of bird skins—some collected 150 years earlier by a contemporary of Darwin's, Alfred Russel Wallace, who'd risked everything to gather them—and escaped into the darkness. Two years later, Kirk Wallace Johnson was waist high in a river in northern New Mexico when his fly-fishing guide told him about the heist. He was soon consumed by the strange case of the feather thief. What would possess a person to steal dead birds? Had Edwin paid the price for his crime? What became of the missing skins? In his search for answers, Johnson was catapulted into a years-long, worldwide investigation. 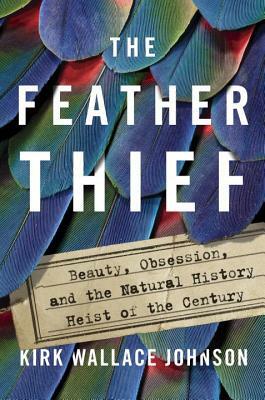 The gripping story of a bizarre and shocking crime, and one man's relentless pursuit of justice, The Feather Thief is also a fascinating exploration of obsession, and man's destructive instinct to harvest the beauty of nature. Kirk W. Johnson is the author of To Be a Friend Is Fatal and the founder of the List Project to Resettle Iraqi Allies. His writing has appeared in The New Yorker, The New York Times, The Washington Post, and the Los Angeles Times, among others. He is the recipient of fellowships from Yaddo, the MacDowell Colony, the American Academy in Berlin, and the USC Annenberg Center.